What are the best foods to take on a boat? There’s no right answer to this one – it all depends on who you have on board with you on that day, what they prefer, how much time do you plan to spend on cooking, and so on. Personally, I would classify my pontoon trips into three main categories – fishing trips, relaxed Sunday afternoons with my wife and a couple friends, and more action-packed, typically kids-on-board type of days. 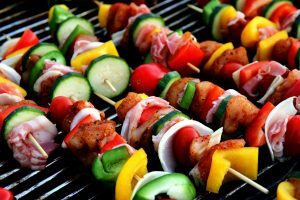 I would usually take a few pounds of meat and veggies and whip up a barbecue when going out on a leisure boat trip – if I’m in the mood for cooking, that is. Most of my boater friends actually don’t like the idea of cooking on the boat, and prefer to bring finger food from home, but I actually enjoy the experience of flipping a burger on my boat of a sunny afternoon and enjoying it fresh off the grill. However, I can’t deny that homemade finger food is a great alternative, no matter what the occasion is. You can always whip up a couple types of pressed sandwiches, wraps, fresh veggie kebabs, or sliced fruit, throw them in a cooler, and you’ll be good to go. You can also rely on a couple classic snacks to keep the kids happy and satisfied – trail mix, candy, popcorn, and mini cookies are all excellent choice. Be careful with the likes of nachos and chips (and anything crumbly in general) though – you’ll have to vacuum the deck after having those to avoid a pest/mice infestation. For those with a sweet tooth, the best thing I can think of are homemade or bought granola bars and cookies – but again, beware the crumbs! What foods do I usually avoid taking on my boat? Again, I like avoid bringing anything too crumbly on board, so I prefer to steer clear of chips and cookies. Obviously, anything that can’t be enjoyed cold, or that requires a lot of cooking is a no-no as well. So no soup, mac-n-cheese pots, chilli, pasta (except pasta salad), or the like. How to store food on the boat? There are three main rules for storing food on a boat. One – stock up on ziplock bags. Two, get a marine-grade cooler box – they keep the temperature for much longer than regular cooler boxes. Three, make sure raw foods never touch ready-to-eat ones. There’s no rocket science there – just make sure the beer and easily spoiled things are always kept in the cooler, away from the sun, and that the ready-to-eat snacks are well isolated from the raw burgers. Great tips man, me and my family always end up forgetting to pack food when going out on the late and end up buying a bunch of random snacks on the way. I’ll consider getting a grill for my pontoon for next summer though, barbecue sounds like a ton of fun.